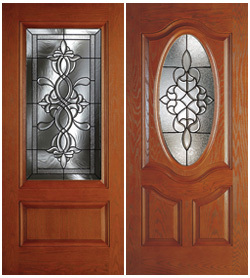 Browse > Home / Replacing your entry door? A front door is an important purchase. It’s the centerpiece of the front of your home. If you are looking to replace an existing door it’s the perfect time to upgrade and increase your curb appeal. When looking for a door you should consider what elements are most important to you. Style, material, security, durability, energy efficiency and versatility. Order those elements and narrow down what door you want by which door most closely matches your list. Before you make your final decision make sure you see what kind of options are out there for doors. It’s hard to make an informed decision if you don’t know all the variables. For instance some doors have mini blinds sandwiched between panes of glass. Giving you greater control in regards to privacy and lighting than you would have with a decorative glass pane. It’s not a commonly seen feature so without looking around you might not have been aware it could be an option.